Tesla Model 3 has hit the European peninsula with a storm, after Norway’s craziness for the compact electric sedan, Germany is also loving an American car that does not pollute their environment. Kraftfahrt-Bundesamt (KBA)- Federal Motor Transport Authority of Germany just released the new car registration statistics for the month of March and Year-to-Date (YTD) figures and growth compared with the previous year as well (high-res chart below) — Tesla is the only company with 3 digit growth this year. For the month of March, Tesla vehicle registrations grew by +453% compared to the same month last year and the YTD growth shoots to +439.9% — surely this impact came with Model 3 shipments that started in February. The total number of registered Tesla vehicle units in the month of March is 2,367 and at the end of Q1, 2019 the toll stands at 3,596. With the second quarter of the year just starting, this trend seems to only go higher, according to reports the Tesla Model 3’s German inventory is almost empty, waiting for new shipments to arrive. Let’s look at the new vehicle registration chart for Mar and YTD by Kraftfahrt-Bundesamt (KBA) to see how Tesla has started impacting the German automotive industry. 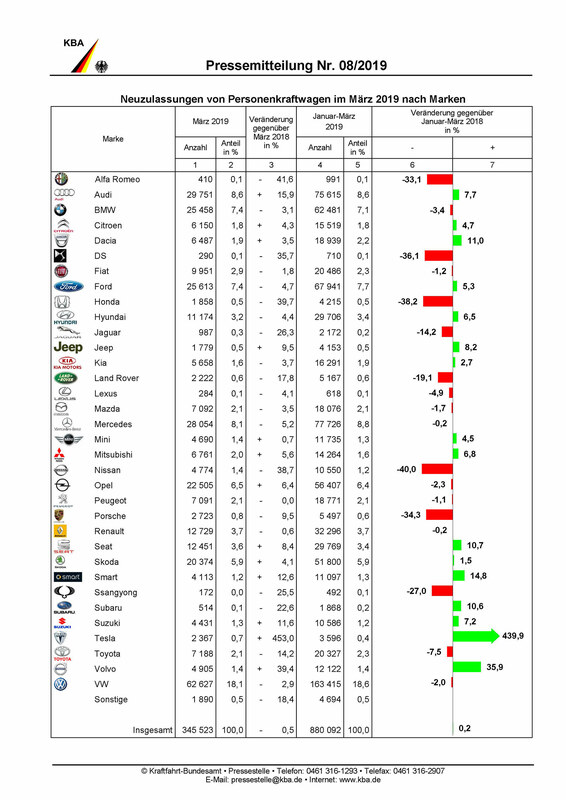 New vehicle registrations in Germany for the month of Mar and Q1, 2019. Click/Tap to zoom-in / download. Tesla’s closest competitor in this year’s growth till now is Volvo with +35.9% increase in new car registrations, which is ~12 times less than Tesla’s numbers. Nissan’s new car registrations are down by a staggering -40%, this is a company with defined electric vehicle goals but seems to be losing the charm. Internal Combustion Engine (ICE) & hybrid car manufacturers are also losing traction in the market, Alpha Romeo (-33.1%), Honda (-38.2%), Land Rover (-19.1%), Porsche (-34.3%), Toyota (-7.5%), and VW (-2.0%) (all figures are YTD 2019 vs. 2018). Jaguar, despite the launch and sales of its I-Pace electric SUV, is showing a -14.2% loss in new registrations when compared with Q1, 2018 — Germany’s own Mercedez Benz barely holds its position in the market with just -0.2% loss in new vehicles registered. This might not all be due to the invasion of the Tesla Model 3 in Europe but a lot of it seems to be. Let us know your thoughts in the comments section below if you think Tesla has started disrupting the old and big players like VW and Daimler on their own home ground.